Brief Synopsis – A man accused of being a communist in the 1950’s gets amnesia and is mistaken for a long lost small town war hero. My Take on it – Frank Darabont has proven to be a great writer and director with his masterpieces The Shawshank Redemption (1994) and The Green Mile (1999). His follow up movie was this gem that most people missed. Jim Carrey is excellent here as a man who is trying to figure out who he is. He is very genuine here and I believe that this is one of his best dramatic performances. He shows that he doesn’t always have to play crazy over-the-top characters to be effective. Darabont slips slightly here since it would be hard to top his previous two directing efforts and this one is not as good. The thing about him is that he knows how to take the viewer to a different time and place and make it so believable that we think we are truly there. 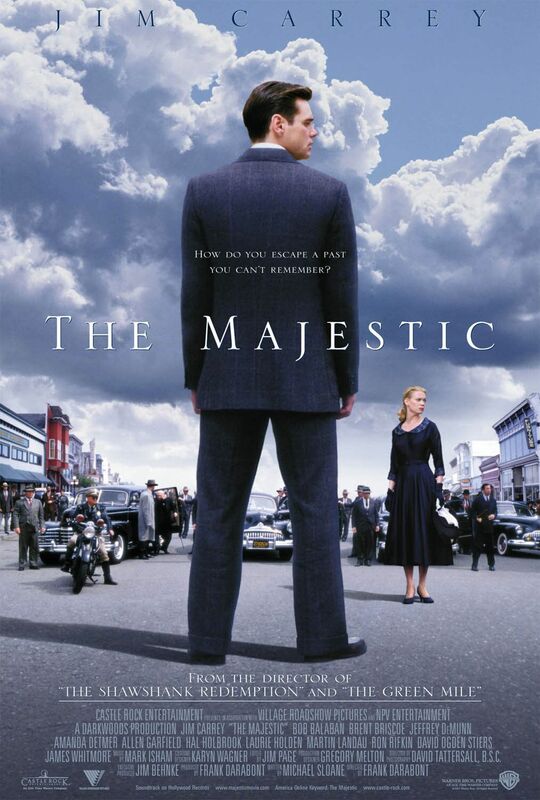 This little town in California that even a few years after the end of WWII was struggling with it’s losses really came to life and this movie has a nostalgic feel to it that not many movies are able to achieve. I liked this movie more during my previous viewings and have even slightly lowered my rating after this viewing but that is mainly because I felt less of a connection now than I did then which has to do with the B-story which just drags the story out a bit. The B-story about MaCarthism falls a bit flat for me. I know a bit about that era and besides the movie The Front (1974), I don’t think any other movie has been able to accurately portray the anguish that there writers/actors etc. went thru during the era of The Red Scare. All in all, this is a very heartwarming movie and worthwhile trying to catch on DVD since it takes us movie lovers back to an age where going to the theater was a majestic experience. Bottom Line – One of Carrey’s best dramatic roles. Darabont falters a bit here but still is in fine form. Very nostalgic aura to this movie. Recommended! I think I somehow managed to miss that this film was even made. Weird.